Beautifully worded post. Agree with each and every word. I'd also like to add that even though he was aggressive, his was "gentlemanly aggression". You might scoff at that phrase and say its an oxymoron until you see the SreeSanths, the Yuvis and the Bhajjis displaying their rude and arrogant behaviour! Hats off Dada, or maintaining your dignity in the face of so many ups and downs during your career. You will definitely be missed! Indians have a tendency to remember the recent most performance of the player and the media has been cashing major time on tht...The gr8s have been criticized a million times by media and people (would not say fans here) going the same...but worth greater than million is tht these people had proved themselves and are still proving ...its just the way these people do things...and thts why these people are called gr8s..
As said abt aggression I would totally agree with Sanjay and would like totally appreciate the aggression shown off by youngsters on the field...actually that is the way cricket is played today and it has been established not by anybody but the world champions...so to defeat them you need to give a taste of their own medicine...the youngsters will show aggression, its the duty of the captain to channelize it in the right direction which I think Dhoni is doing very well currently...it was a pleasure to watch the look on every australians face about the 8-2 field setting while forgetting that they done the same thing in 2004 Sydney test..."Come on mate" whats is so negative about it..
Ganguly is inspirational. My best wishes for his next inning of life. I had submitted your post "Problem with Emotions" to BlogBharti. Apparently, they do not feature very old posts (yours is almost 2 years old!) Instead, they have featured your "Farewell to Dada" post. Its a pity I dint know about aggregators like BlogBharti and Desipundit in Jan 2007 (when you had written "Problem with emotions" !! Thanks a lot Kiran. I hadn't heard of BlogBharti before. Do tell me about other similar sites. 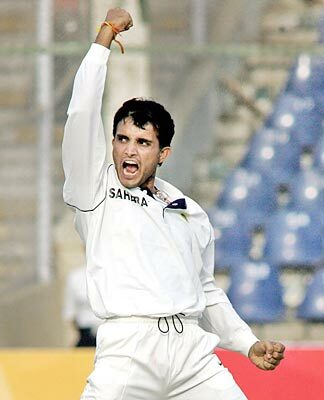 The great Ganguly is not done yet. He might soon be seen in new, bigger field. With the rare qualities of leadership and character that he possesses, he should seriously consider the option of making an impact at the national level and bring about the desired change and self respect there too…shades of India’s own Obama?